Hey, if you can put bacon on cupcakes, why not Stuffing Cupcakes with sausage and cranberry frosting? This is the good stuff(ing) -- just ask my skeptical wife; and she has patiently been the recipient of some of my more outlandish culinary creations, like Pita Pizzas topped with Clams and Artichoke Hearts. This is a fun party appetizer. Too much stuffing for the big bird? Make a few cupcakes with the extra and bring a bowlful to the Thanksgiving or Christmas table. Doesn't that look delicious? Stuffing Cupcakes need just a little binder - one egg and 1/4 cup of flour to hold it all together. The frosting is regular canned cranberry sauce heated until soft like jelly. 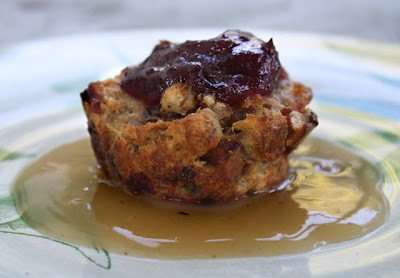 Make your favorite chicken or turkey gravy for a dipping sauce (I found a jar of turkey gravy at The 99c Only Store), or, more formally, serve each cupcake in a pool of gravy. 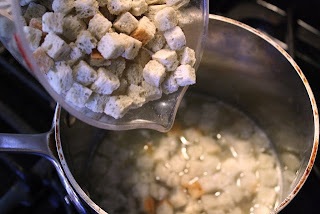 You can use your favorite holiday stuffing recipe; I used 99 cent packaged cornbread stuffing mix. And you can add anything to stuffing: from sausage to chestnuts and dried fruit, or saute aromatics like onion, bell pepper, celery, garlic and any fresh herbs you have in your garden. My recipe is adaptable for my vegetarian friends. 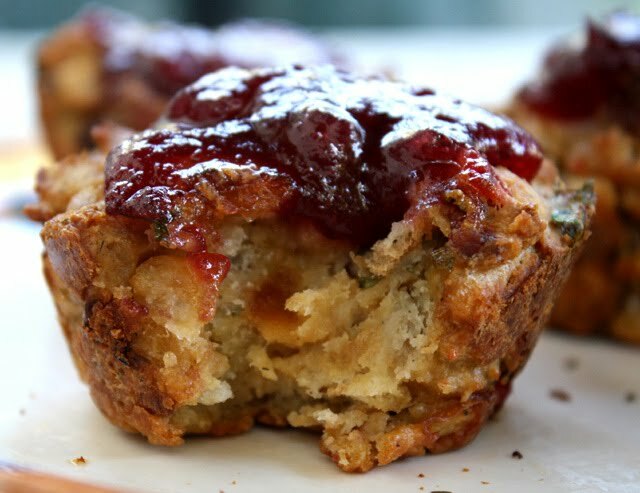 What's nice about stuffing as a cupcake is you get more crunchy crust than with typical stuffing from a turkey, and you still get a moist, soft center. Why have cranberry sauce on the side, when you can slather it on the cupcake like jam? As for gravy, it makes a great dipping sauce. All my ingredients come cheap this time of year. Bags of stuffing, cranberry sauce and breakfast sausage are on sale. Your kids may balk at a Stuffing Cupcake, but the adults will like it. Hey, pile on enough cranberry frosting and the kids may come around. Pull this recipe out for Christmas, too! Also go here to embed or view from the KCTS website. 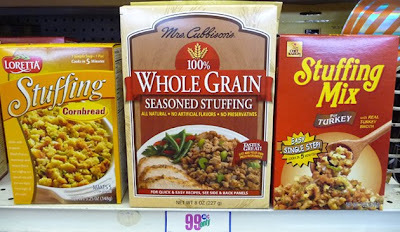 3 cups of stuffing from package (about 6 oz.) - cornbread or your favorite. 8 oz. of cranberry sauce, from the can, for frosting. Whole cranberry sauce works well. 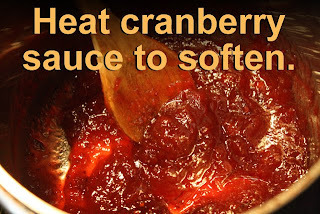 Heat cranberry sauce in a pot for 5-10 minutes. Break it apart as it heats - it will become like soft jelly. Remove from heat, allow to cool and refrigerate until ready to serve. Prepare 3 cups of stuffing according to package directions. 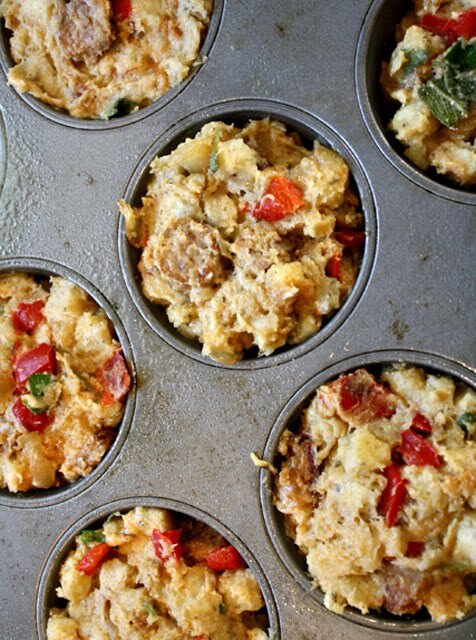 Usually add one cup of hot water to stuffing in a large bowl. 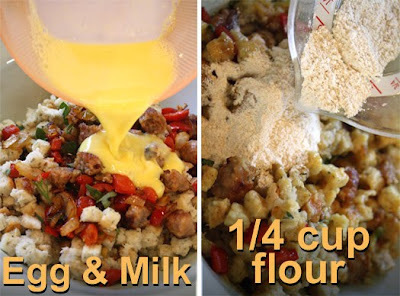 Mix until stuffing is spongy and soft. 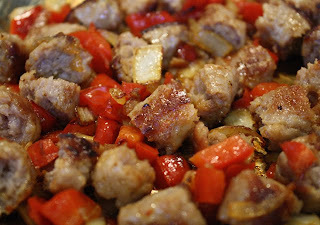 Saute 4 sausage links and break them into small slices or chunks. Add onion and bell pepper and cook until veggies are soft, about 5 minutes. Add meat, vegggies, and a 1/4 cup of flour to stuffing. In a small bowl, whisk together 1/4 cup of milk and one egg. Add it to stuffing and mix well. Grease your cupcake pan with butter or oil spray. Scoup in enough dressing to fill each one. Bake in 350 degree preheated oven for about 45 minutes. When cupcakes are done, you may need a knife to cut around the top edge of each cupcake, to keep them from tearing when removing. While cupcakes cook, make your favorite chicken or turkey gravy (it's okay to use packaged or from jar). I have a few gravy recipes, including a delicious mushroom gravy recipe, just click here. Right on. Another solid creation. HAPPY THANKSGIVING! Those cupcakes look so delicious! Your creation really is an inspiration! Tried this recipe last week. Nomnomnomnomnom!!! Very tasty! I plan on trying this in the small muffin tin for hours d'ouvres! I think they will make the perfect little bite! All of my YouTube Videos - over 299 so far! Corn Dog Recipe and Party! The 99 Cent Chef in Las Vegas! Football Superbowl Recipes - Touchdown! The Great Taco Hunt - L.A.
Eater LA - Food News in L.A. Still Tasty - When does food go bad? Paradise Leased - Historic So. Calif.